NASA conducted a grand sendoff for space shuttle Atlantis on Friday as the shuttle was moved it rolled 10 miles from its workplace of almost 30 years to a new, custom-built museum exhibition equipped with some of the most high-tech displays imagined. “Godspeed, Atlantis, on your next mission of inspiration and motivation,” said NASA Administrator Charles Bolden shortly before signing over the retired shuttle for permanent display. “Atlantis’ final mission may have closed out the space shuttle program, but the spirit that created that program and built her is very much alive.” Shuttle-era astronauts and members of the workforce who readied the space shuttles for 30 years came in before sunrise to see Atlantis off. 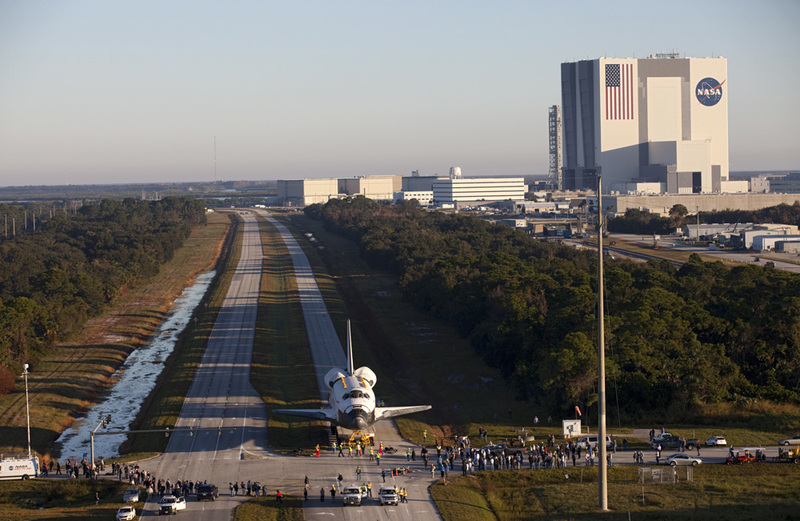 The move began at about 6:30 a.m. with the shuttle backing out of Kennedy Space Center’s Vehicle Assembly Building. Atlantis moved down the wide roadway between the three Orbiter Processing Facility hangars that served as the shuttle fleet’s home before being turned around at sunrise and taking the main roadway south at Kennedy. The trip concluded about 11 1/2 hours later with Atlantis reaching the new exhibit area. The shuttle Atlantis made two ceremonial stops along the way so center employees and then the public could pay tribute. For some, seeing Atlantis move into its final home was worth a special trip of their own. Gayle Dye of Albuquerque, N.M. made trips to Florida to see several shuttle launches and drove to White Sands Space Harbor in her home state to see Endeavour fly over on the back of the 747 Shuttle Carrier Aircraft. 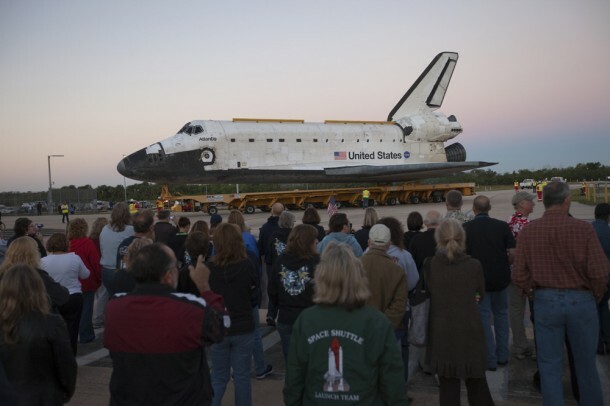 Atlantis made the trip atop Kennedy’s low-slung, 76-wheel vehicle known as the orbiter transfer system. A parade including a marching band and a phalanx of shuttle workers and astronauts accompanied the shuttle to a ceremony to sign over the artifact for display. Bolden, a veteran of Atlantis’ STS-45, said the shuttle program’s 30 years of accomplishments continued the space agency on a path of groundbreaking exploration that NASA has no intention of detouring from. “We did great things and now we are going to do greater things,” Bolden said. “Atlantis now takes on a mission of inspiration for future exploration,” said shuttle astronaut Bob Cabana, director of Kennedy. 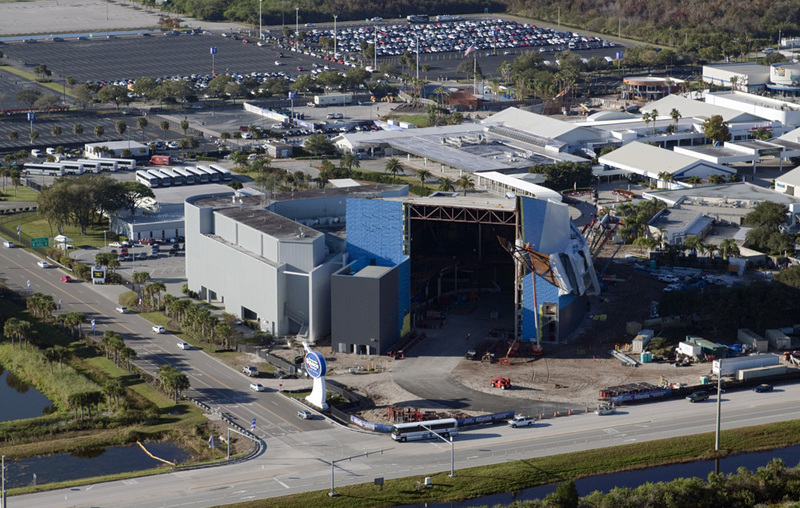 Construction of the mammoth exhibit hall for Atlantis began in January in anticipation of needing to be able to keep the priceless artifact safe while the building is finished around the shuttle. With a 78-foot-wide wingspan and a tail that reaches more than five stories, the spacecraft was too big to be rolled into a completed museum wing. Instead, Delaware North, which operates the Kennedy Space Center Visitor Complex for NASA, built three of the four walls and the roof of the new facility. Atlantis will be rolled in through the open side and workers will quickly erect the fourth wall to close it in. Although it covers 90,000 square feet, the exhibit hall will require close attention for the workers since there will be a mere six-inch clearance in some places. Atlantis will be covered in some 16,000 square feet of shrink wrap to protect it while workers finish the inside of the exhibit hall and then stand Atlantis on a 36-foot-high pedestal where it will be seen as it flew in space. The cargo bay doors will be open, the landing gear retracted and the robotic arm will be deployed. The museum is slated to open in July 2013. Following a signing ceremony, Atlantis was taken on a route through Kennedy’s industrial area where it passed by the center’s headquarters and other facilities before taking a turn and passing by the Space Life Sciences Laboratory, a research facility whose work includes developing and implementing scientific experiments for the International Space Station. The shuttle convoy paused at Exploration Park for a few hours where visitors could see the gigantic spacecraft up-close, take pictures with it and participate in a festival of space-related displays and activities. “It would’ve been weird not to come out here,” said Kim Siems, who lives near Kennedy. A crowd numbering in the thousands included former shuttle workers, astronauts and lots of people drawn to the opportunity to see a space shuttle almost within touching distance. “I missed out on seeing a launch, and I knew this might be the last chance I’d get to see it this close,” said Greg Saffer of Tampa, Fla.
Atlantis made its first trip into orbit in October 1985, when it flew a classified mission for the Department of Defense. It made its second trip into space a month later and by the time it retired in 2011, Atlantis had completed 32 successful missions. STS-51J, as Atlantis’ first flight was designated, was commanded by shuttle veteran Karol “Bo” Bobko, who reflected on the spacecraft’s first mission during the signing ceremony. He had been on two other shuttle missions that also were maiden voyages for the spacecraft and the way to launch on those included several delays and changes. Not so with Atlantis. “My third flight was the first flight of Atlantis and it went on-time to the second,” Bobko said. “For me, Atlantis represents something that reflects the maturity, the reliability and capability of the space program. Atlantis’ mission log includes launching the Magellan spacecraft to map Venus and the Galileo probe to Jupiter, both in 1989. In 2009, Atlantis conducted the last servicing mission to NASA’s Hubble Space Telescope, outfitting the groundbreaking observatory with new sensors and the hardware it would need to remain functional. Having started its spaceflight career flying Cold War missions, Atlantis became a high-profile symbol of cooperation in 1995 when the shuttle docked with the Russian space station Mir. “It wasn’t possible until the end of the Cold War,” Launius said. It was the first of seven missions Atlantis would conduct to the Russian outpost, bringing astronauts and supplies to the station and advancing research into long-term spaceflight. The missions set up a formula that would be followed and expanded as NASA and Russia built the International Space Station, a construction effort Atlantis played a central role in. “The Mir missions are essentially the dry run for the cooperative effort for the International Space Station,” Launius said. Atlantis is the third and final shuttle of NASA’s former operational fleet to be moved into a museum. Discovery, the oldest active shuttle at its time of retirement, has been on display in the National Air and Space Museum’s Udvar-Hazy Center outside Washington, D.C., since April. Sandy Magnus, a mission specialist on Atlantis’ last mission, recently saw Discovery on display. “It was really neat to stand there and look at all the people, they were all excited to see the space shuttle, it was really neat to see people appreciate them the way they need to be appreciated,” Magnus said. Endeavour’s exhibit hall at the California Science Center in Los Angeles opened this week after the spacecraft was flown to the West Coast. Enterprise, which conducted glide tests to prove the shuttle design would work, is in the hands of the Intrepid Sea, Air and Space Museum in New York.